Today is World Poetry Day, a UNESCO-designated day to recognize the role of poetry in expressing the common experience of humanity, and to encourage people around the world to read, write and publish and otherwise celebrate poetry in all its forms. We’re in the business of sharing great poetry all year long, but on World Poetry Day it’s especially important to make compelling, thoughtful verse available to all. That’s why we’re giving away this free broadside to poetry lovers everywhere. 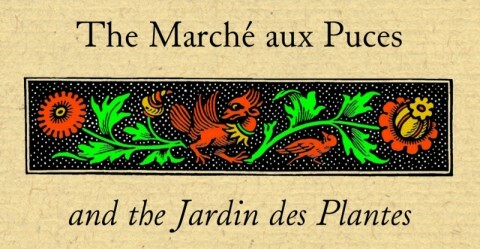 This broadside features Hine’s meditation on beauty, art and life, “The Marché aux Puces and the Jardin des Plantes” from The Essential Daryl Hine. Enter below to receive your free broadside. It’s easy! Simply tweet your participation in the giveaway. Don’t have Twitter? No problem. You can enter just by browsing our Essential Poets page, or by checking out our top poetry picks. NOTE: Since this is a high-resolution file, it may take several minutes to download. Be patient—it’s worth the wait! Giveaway available to first 100 entrants. Open while supplies last or until 11:59:59 p.m. on March 30, 2016. This entry was posted in Letters from the Porcupette (the Intern's Blog) and tagged giveaway, The Essential Daryl Hine, World Poetry Day. Bookmark the permalink.